Meet the chubby pig on Pig’s Feast Slot at Moon Games casino. His appetite matches his size and he can guide you to good fortune! Powered by Eyecon, it is a 5-reel 25-line game based on Chinese culture in which pigs symbolise luck and wealth. Here, the belching pig is a symbol of abundance! The game is set against a colourful background with cartoonish graphics showing red lanterns and festive buntings. Join the chubby pig for a great feast for Spring Festival as you spin the reels which are full of delicious dishes like Teapots, Rice Bowls, Hot Soups and Dumplings, as well as the Pig and the Lady Pig. Join the party at Moon Games using any kind of device! Be ready to relish the goodies on Pig’s Feast Slot! Kick start your gameplay by toggling the “Coins” button and choose your preferred bet amount. Click on the Spin tab to activate the reels. With at least 3 matching symbols on the reels, you can be awarded a win. Plus, make use of the Auto Play feature which lets you pick several rounds played in rapid succession. 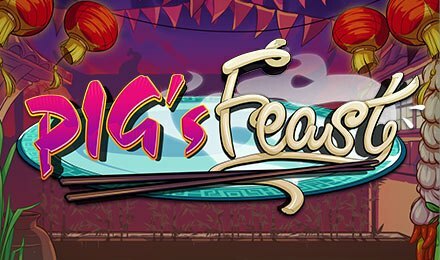 Bet Levels: There are no bet levels on Pig’s Feast Slot. Amount of Paylines Selection: On Pig’s Feast Slot, the Pig icon stands for Wild and replaces any symbol in a winning combination apart from the Lady Pig. When this happens, the payout is doubled! Coin Values: When at least 3 male Pigs appear on the reels, the Free Games feature is activated on Pig’s Feast Slot. Land 3, 4 or 5 such symbols to earn 15, 20 or 25 free games, respectively depending on which dumpling you pick during the Prize Pick Feature. On Pig’s Feast Slot, the Pig icon stands for Wild and replaces any symbol in a winning combination apart from the Lady Pig. When this happens, the payout is doubled! When at least 3 male Pigs appear on the reels, the Free Games feature is activated on Pig’s Feast Slot. Land 3, 4 or 5 such symbols to earn 15, 20 or 25 free games, respectively depending on which dumpling you pick during the Prize Pick Feature. Pig’s Feast Slot also includes a Prize Pick Feature! It is activated with 3 or more Lady Pig symbols. During this round, the Lady Pig holds a platter full of dumplings. Pick any of these mouth-watering goodies to win a maximum prize of 100x the triggering bet. Also, receive 2, 3 and 5 picks with 3, 4 and 5 Lady Pig symbols, respectively. Don’t miss the Rice Bowl symbols as they stack up on the reels of Pig’s Feast Slot! When they reach the top, fireworks are triggered and random multiplier amounts are revealed. Join the festive atmosphere at Moon Games with Pig’s Feast Slot. Meet the chubby pig for a great time and good luck!